Those struggling to define the style of the Arts and Crafts Movement of the 1870s should pay a visit to Red House in Bexleyheath. William Morris, textile designer, architect, writer and founder of the simpler style of Arts and Crafts, commissioned and lived in this beautiful home from 1860. Red House is a wonderful mixture of architectural shapes and styles which work together to make this extraordinary red-brick house well worth visiting. Designed by fellow-craftsman Philip Webb, it was described as "the beautifullest place on earth" by Edward Burne-Jones, and so it appears today. 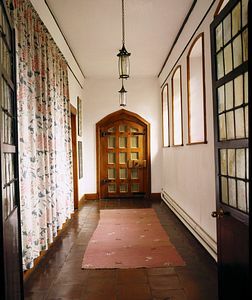 mark of the handcrafted Arts and Crafts movement, which incorporates both Gothic and Medieval styles. The house and gardens are considered to be a local landmark of great historic significance in the history of architecture and garden design. Decorated by many of Morris's well-known contemporaries including Dante Rosetti and Edward Burne-Jones, its rather medieval style was a huge influence on developing fashions at that time. Victorian homes were generally far more fussy, with heavy swags, gilts, ruffled flounces and oppressive decor. Morris introduced simpler interior designs for furniture and glorious rich colours in his fabrics, carpets and wallpapers through his firm of Morris, Marshall, Faulker & Co. His cosy style is still emulated today. Ironically, at a time when the Industrial Revolution had revolutionised mass production, Morris's Arts and Crafts movement returned the emphasis to traditional craftsmanship and decorative arts using simple skills. Not content to make the bold exterior of Red House an example of the eclectic Arts and Crafts design, the interior is quite superb. 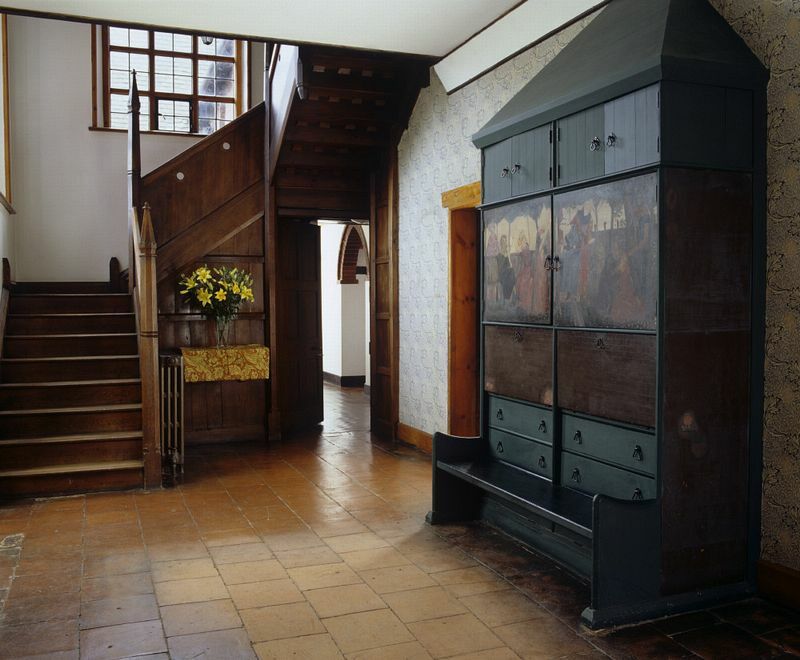 Tours of this lovely National Trust property reveal the original interior features and built-in furniture, designed by William Morris himself. Admire the stained glass windows and wall paintings along with Morris's easily identifiable original wallpapers and rare printed fabrics for which he became so well known. His emphasis was on simpler designs based on nature-inspired patterns and included furniture, frescoes, glasswork and embroidery, many of which are on display in Red House. Morris firmly believed that gardens should clothe a house and so equal thought went into the beautifully designed gardens of Red House. The well with its steep conical roof was designed by Morris as the social centre of the gardens and is a delightful centrepiece. Red House was only recently acquired by the National Trust and has been fully restored in authentic detail as a tribute to William Morris in conjunction with the Victorian Society, English Heritage and Bexley Council. Many original furnishings have been reinstated in Red House after years on display at the Victoria and Albert Museum and plans for a study centre are now being worked on. For those who want a unique reminder of their visit, the Red House gift shop has a wonderful selection of Morris-related china, textiles, books and gifts. The Old Stables has a second-hand bookshop and light refreshments are available in the tea room. Alternatively visitors can bring a picnic and enjoy it in the orchard. M25 Jct 2 to A2 for Bexleyheath. Exit at Danson interchange and follow A221 Bexleyheath.